Generally, the only individuals who cannot be disinherited completely are surviving spouses, unless the married couple had an agreement, such as a prenuptial or antenuptial contract. Absent an agreement, surviving spouses cannot be entirely disinherited because the law entitles them to a portion of marital property. Children, on the other hand, may be disinherited unless the deceased parent lived in Louisiana, the only state in which a child has a right to inherit by law. A child may assert that she was not purposely disinherited by contesting her parent's will. To contest the will, she must file a notice of contest with the probate court in the county where her parent lived. Typically, a child contesting a will must provide clear and convincing evidence that her parent's will is invalid or that she was disinherited accidentally. If the probate court is convinced, it may grant a portion of the parent's estate to the child. Although wills are generally presumed valid, there is also a presumption that a testator did not mean to disinherit a child if he didn't explicitly do so. Additionally, it may be presumed that children born after a parent's will was made may have been accidentally omitted. For example, if a parent left property to all of his children in a will then had another child after the will was executed, a probate court may conclude that the "after born" omitted child is entitled to a share. A disinherited child may also contest a parent's will if she believes her parent was under undue influence or duress when he executed the will. If a parent was under undue influence, it typically means he was mentally or psychologically controlled or influenced by someone he trusted when making the will. Being under duress means the testator felt he had no option -- due to threats of bodily harm, coercion or physical restraint -- except to execute his will according to the instruction of the perpetrator who threatened to hurt him. 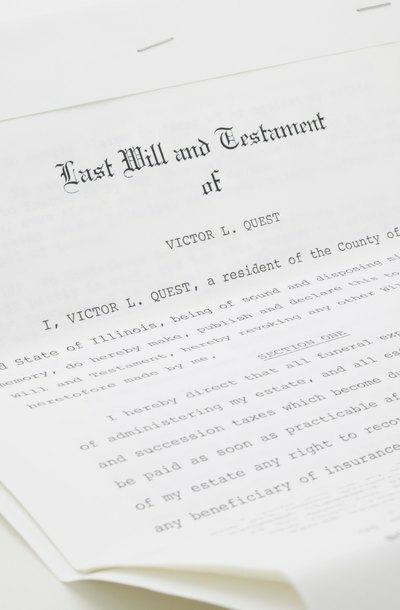 A will containing the directions and provisions for loved ones after a person's death generally does not expire, but some events may trigger the will's revocation. The exact events that invalidate a will or some of its provisions depend on the laws of the testator's state; however, some triggering events are more commonly found in all state laws.